2. On Eric Clapton: "Eric Clapton wrote the book, man - The Contemporary White Blues Guitar, Volume I. His style and technique is what's really amazing. He's got a lot to say, and the way he says it just knocks me out." 3. On Miles Davis and John Coltrane: "Miles Davis does the best job, to me, of portraying the innermost, subtlest, softest feelings in the human psyche. He does it beautifully. John Coltrane, probably one of the finest, most accomplished tenor players, took his music farther than anybody I believe I ever heard." 4. On his and Gregg's first proper band, the House Rockers: "We were a smokin' band! Boy, I mean, we would set fire to a building in a second. We were just up there blowing as funky as we pleased; 16 years old, $41 a week - big time. And all we wanted was to hear that damn music bein' stomped out. That's what I love, man, to hear that backbeat POPPING, that damn bass plonkin' down, man, Jesus God!" 5. On the brothers' first professional band, Hour Glass: "A good damn band of misled cats was what it was. They'd send in a box of demos and say, ‘Okay, pick out your next LP.’ We tried to tell them that wasn't where we were at, but then they got tough: ‘You gotta have an album, man. Don't buck the system - just pick it out!’ We figured maybe we could squeeze and ounce or two of good out of this crap. We were squeezing rock! It's cats tryin' to get off on things that cannot be gotten off on." 6. On his moving to Muscle Shoals, Alabama, as a session player: "I rented a cabin and lived alone on this lake....I just sat and played to myself and got used to living without a bunch of that jive Hollywood crap in my head. It's like I brought myself back to earth and came to life again, through that, and the sessions with good R&B players." 7. On becoming disenchanted with studio life: "Studios - that's a terrible thing, man! You just lay around and get your money. All of those studio cats I know, like one of them gets a color TV, see, and then the next day, man, they're all down to Sears or wherever - 'Hey' I'd like to look at some color TVs.'... They're just keeping up with the Joneses and not playing their music. The sessions I do now, I just go in there and do it and leave." 8. On the jam that formed the Allman Brothers Band: "We set up the equipment and whipped into a little jam. It lasted two-and-a-half hours. When we finally quit, nobody ever said a word, man. Everybody was speechless. Nobody'd ever done anything like that before - it really frightened the sh** out of everybody. Right then I knew - I said, 'Man, here it is!' I told Rick [Hall - owner of Fame studios at Muscle Shoals] I didn't want to do session work full-time anymore. I had found what I really wanted to do." 9. On the imminent recording of Live at Fillmore East: "The stage is really our natural element. When bands start to play, they just play live. We haven't got a lot of experience in making records. I do, a little bit, from doing sessions, but not like a polished session man or anything. We get kind of frustrated doing the records, so consequently our next album will be for the most part a live recording to get some of that natural fire on it. We have rough arrangements, layouts of the songs, and then the solos are entirely up to each member of the band. Some nights we are really good, and some nights ain't too hot, you know. But the naturalness of a spur-of-the-moment type of thing is what I consider the most valuable asset of our band. When you make records, you can't just do it over and over if somebody makes a mistake. Plus, the pressure of machines and stuff in the studio makes you kind of nervous. So a live album, I'm sure, would probably be the best thing." 10. On free concerts, e.g. Piedmont Park in Atlanta: "Anytime you're getting paid for something, you feel like you're obligated to do so much. That's why playing the park is such a good thing, because people don't even expect you to be there. About the nicest way you can play is just for nothing. And it's not really for nothing - it's for your own personal satisfaction and other people's, rather than for any kind of financial thing. A lot of bread hangs people up; they try too hard. You can either do something or you can TRY to do something. Whenever you're trying to do something, you ain't doing nothing." 11. On recording Layla and Other Assorted Love Songs: "I went down there to listen to them cut [Layla], that's what I went for. And well, like he'd heard my playing and stuff, and he just greeted me like an old partner or something. He says, 'Yeah, man, get out your guitar. We got to play!" So I was just going to play on one or two, and then as we kept on going, it kept developing. Incidentally, on sides 1,2,3, and 4, all the songs are right in the order they were cut from the first day through to 'Layla' and then 'Thorn Tree'. I'm as proud of that as any albums that I've ever been on. I'm as satisfied with my work on that as I could possibly be." 12. On Eric Clapton's guitar on the Layla album: "He gets more of an open, slidey sound. But here's the way to really tell: He played the Fender, and I played the Gibson. The Fender is a little bit thinner and brighter, a sparkling sound, while the Gibson is just a full-tilt screech." 13. On Rock 'n' Roll: "Everybody is expending all this energy in various ways to get the same old feeling out of it that Little Richard can get in five minutes. And people are finally waking up to the fact that you can get as much of a good feeling out of a simple thing as you can out of something that's hard. A lot of people who would have you believe they are intelligent musicians are playing sh** . Music's become so intellectualized. Man, music is FUN. It's not supposed to be any heavy, deep intense thing - especially not rock music, man. That's to set you free! Anybody that ever listened to Chuck Berry or any of them cats knows that. Rock is like a newspaper for people that can't read. Rock and roll will tell you where everything is at. It's something to move your feet and move your heart and make you feel good inside. You know, forget about all the b**s*** that's going on for a while, fill up some of the dead spaces." 14. On other musicians' albums: "Develop your talent, man, and leave the world something. Records are really gifts from people. To think that an artist would love you enough to share his music with anyone is a beautiful thing." 15. On people and life: Everything's the same everywhere. There are nice folks, and a**h****, and you have to learn to distinguish between the two in order to get by. And someone who's an a**h*** to somebody may be a nice folk to somebody else, so you've got to learn to be nice to everybody, and show everybody respect, that's the only way people respect you. You've got to have mutual respect and a little bit of love, if you can round it up. And don't be afraid to share what's inside of you with other people. That's the only way you're ever going to get free or have any fun at all, either. So just rock on, and have you a good time. If I have a choice between having a good time and a sh***y time, I'm going to have me a good time. I've had enough sh***y times." 18. On his bunch of enlightened rogues: "One thing I can say about our band is this. If you got something good to lay on us, enlighten us; but if you got something bad to lay on us, you can get your teeth knocked clean down your throat, man. Dangerous people. Lovely people." 19. As a loyal friend: "Don't you worry about it, boy; you my hoss even if you don't ever win a race." 21. On playing for the sake of the music (to the band): "I don't care if there's a G** D**n brick wall out there. You go out and play to that brick wall." 23. In the wake of Live at Fillmore East: "We're on our way. Ain't gonna be no more beans for breakfast." 27. His New Year's 1969 resolution (from which his epitaph, #26 above, was derived): "This year I will be more thoughtful of my fellow man, exert more effort in each of my endeavors professionally as well as personally, take love wherever I find it, and offer it to everyone who will take it. In this coming year I will seek knowledge from those wiser than me and try to teach those who wish to learn from me. I love being alive and I will be the best man I possibly can." It was at King Curtis' funeral that I last saw Duane Allman, and Duane with tears in his eyes told me that Curtis's encouragement and praise was valuable to him in the pursuit of his music and career. They were both gifted natural musicians with an umlimited ability for truly melodic improvisation. They were both born in the South and they both learned their music from great black musicians and blues singer. They were both utterly dedicated to their music, and both intolerant of the faults and the meretricous and they would never permit the incorporaton of the commercial compromise to their music - not for love or money. "...I remember a magic summer night of music when Duane and Delaney sat on an outdoor patio overlooking the water both playing acoustic guitars as softly as they possibly could and both of them singing - Blind Willie Jonson, Robert Johnson, Jimmy Rodgers, and an unforgettable Jimmy Davis song called 'Shackled and Chained.' The music was incredibly pure - completely free of affect - and almost avoided personality as each of them gave himself over to the eneffable beauty of Southern gospel, country, and blues music as only Southern musicans can. "...Those of us who were privileged to know Duane will remember him from all the studios, backstage dressing rooms, the Downtowners, the Holiday Inns, the Sheratons, the late nights, relaxing after the sessions, the whisky and the music talk, playing back cassettes until night gave way to dawn, the meals and the pool games, and fishing in Miami and Long Island, this young beautiful man who we love so dearly but who is not lost to us, because we have his music, and the music is imperishable." 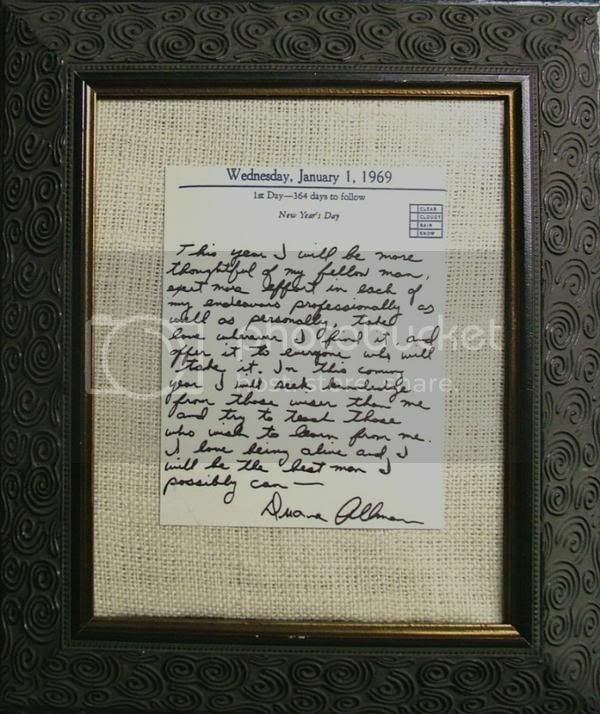 "To know such a person as Duane, which there can be only one, as a brother seems to me a God-given privilege. He greatly affected my life and lifestyle with his love and his music. 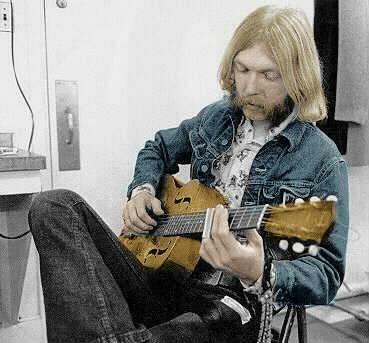 Long live the spirit of brother Duane Allman." Here is a pic of Duanes New Years resolution. I'm saving all those quotes! This made my day better now having read it. I haven't read or heard many quotes by Duane outside of his music, but I knew he was this kind of person just by listening to him play.